I know it’s early days and all that, but this ABC News/Washington Post poll tells you all you need to know about Mitt Romney’s November problem: nobody likes him much. I figure he’ll make up his relatively poor showing among Republicans once the primaries are over and it’s time to sing Kumbaya, but independents and moderates just don’t want anything to do with the guy. 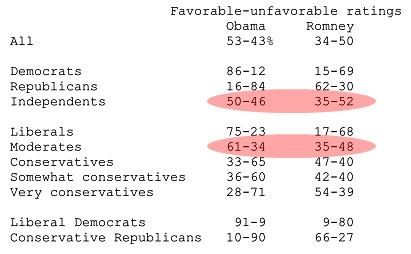 Obama scores decently with both groups, but Romney is completely in the tank. I suppose he’ll make up some of this deficit once the general election campaign starts and he does his Etch A Sketch restart, but he’s got an awfully big hole to climb out of.